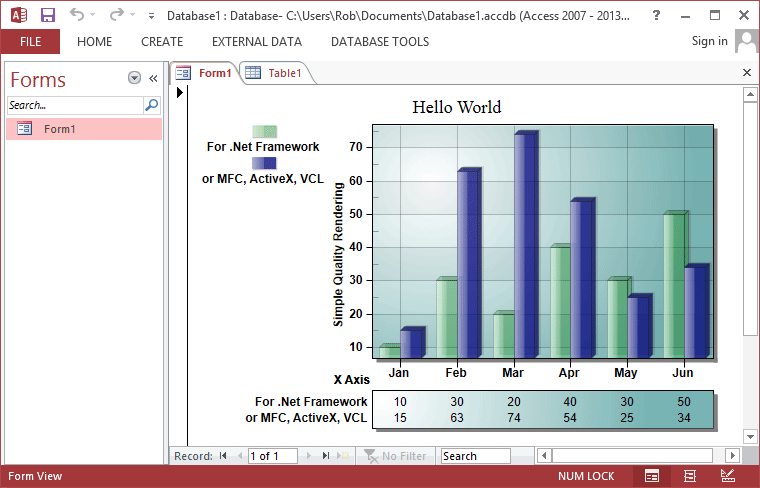 The following information demonstrates how to create your first MSAccess ActiveX Charting implementation. It discusses installation, adding ProEssentials to a project, writing your first few lines of code, and shows the final results. This walkthrough uses 32 bit ActiveXs so this examples is for MS Access 2013 32 bit. When installing ProEssentials, the setup program installs the ProEssentials DLL and ActiveX interfaces into the system directory. The setup program also registers the ActiveXs with the operating system, which prepares MS Access, MS Excel, Visual Basic for inclusion of ProEssentials components. You can manually register an ActiveX with "REGSVR32.EXE" found in your system32 or syswow64 on 64 bit systems. You can also use this utility to manually un-register an ActiveX by using the "-u" command. 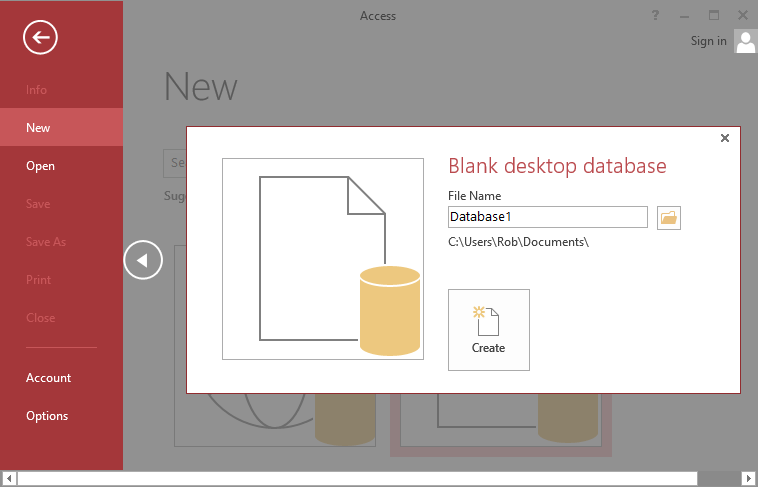 From the New menu, create a new Blank Database. 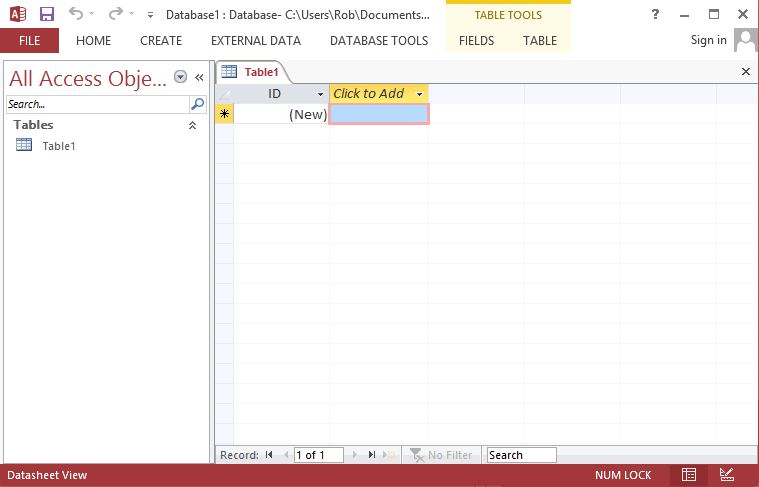 The project opens and shows a default blank table. 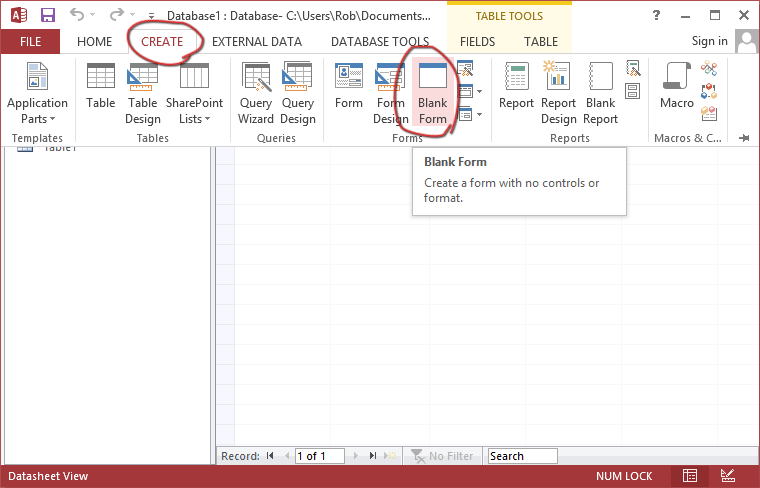 Using the Create menu, Add a new Blank Form. 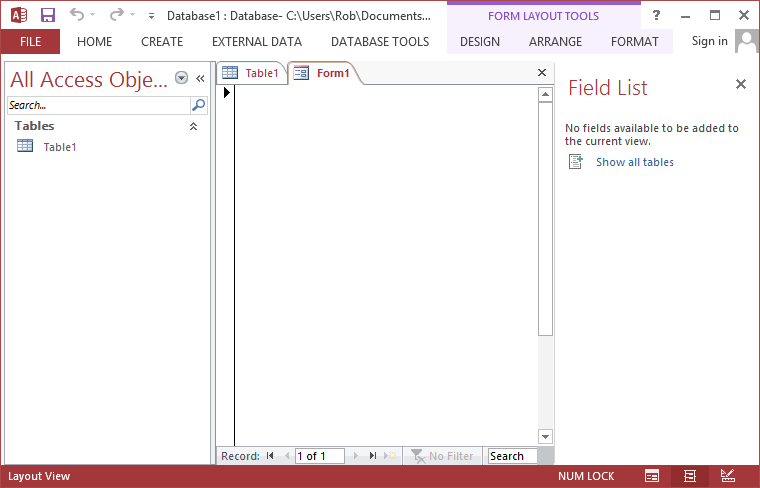 Below shows newly created blank form. 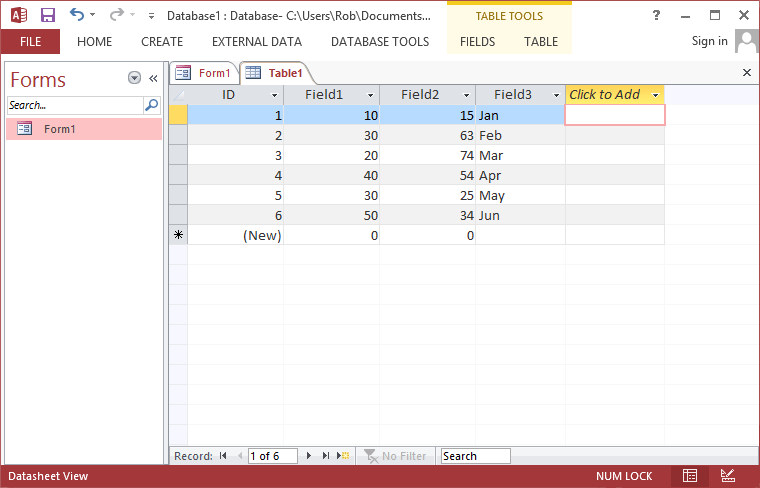 Click / select the Table1 and referring to below image, add a few fields and data as shown. Fields 1 and 2 are number type fields, and Field 3 is a short-string type field. You see the Insert ActiveX Control dialog showing all ActiveX controls registered with the operating system. This image shows ProEssentials v7 and v8 installed, which will only be the case if both the v7 and v8 setup programs have been installed. Select the Pego v9 Control and select OK. 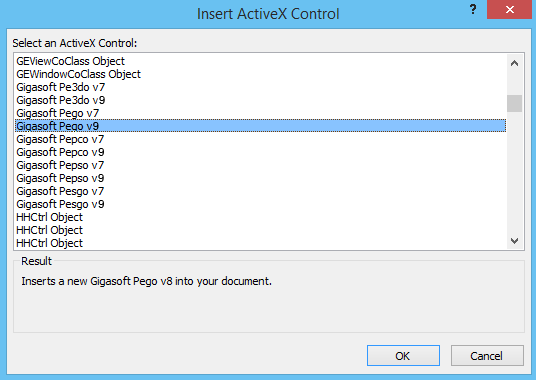 The Pego ActiveX is placed on the form. You may increase its size as needed. Note the design view image may not fully refresh while resizing, toggling the design view button off and on will cause the chart to re-draw to your new size. Select the Design menu, and then Property Sheet menu item to show the property window. 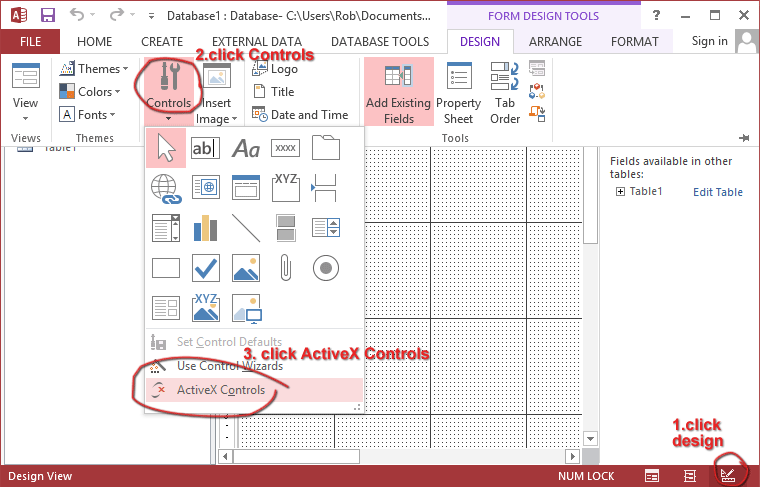 Make sure 'Form' is shown as the Selection Type, click the Event tab, and click the [...] for the OnLoad event to open the Visual Basic editor and add the code below to the Form_Load event. 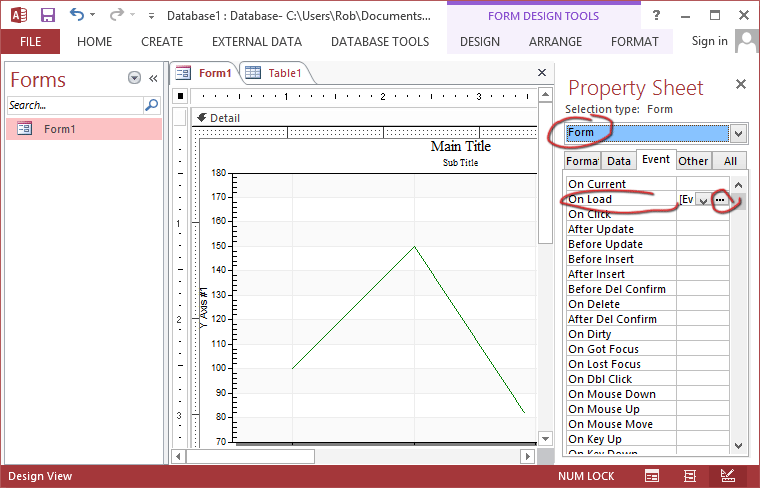 Note that within the design view editor, clicking the solid grey area below the detail section will also select the Form and show Form related properties and events. MySQL = "select Field1, Field2, Field3 from Table1"
This code both initializes the chart with settings and passes data. The SubsetByPoint = False setting configures chart to efficiently allow for the Points property to grow or shrink as needed as long as Subsets stays the same. This code sets Points to a likely maximum, then at the end of the code section sets Points to the actual number of records read. In the process of reading records, the Points property could be increased, though it is most efficient to reduce the number of times Points is changed. Once you become familiar with MS Access code to load tables as needed, there are more advanced features to copy blocks of memory with a function called PEvset. Knowing how to use VB code to read tables into your charts is the most robust skill to learn. Rarely will one SQL populate a highly configured real-world chart. And having the option of sending some SQL results to a Subset and others to our Annotation features will allow for full creativity with the ProEssentials product. 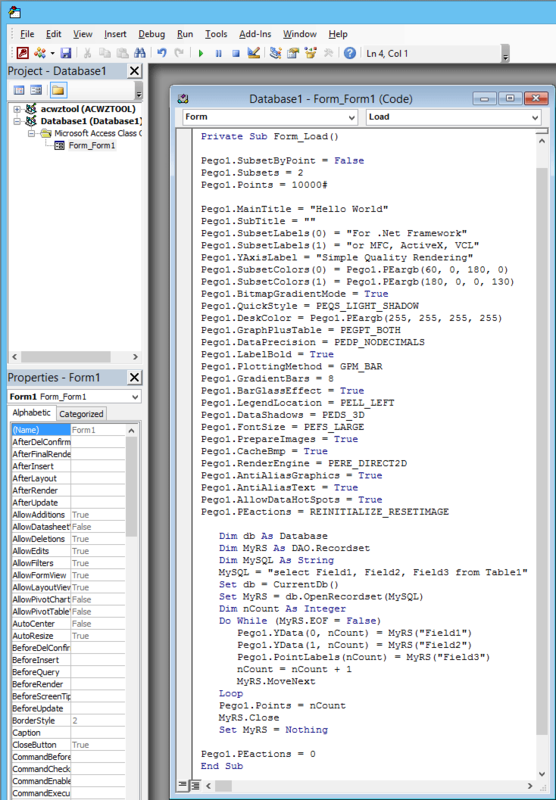 The below code windows show the VBA editor with code as shown.